Fit-Ink: The Chicago Triathlon Is Over...Now What? Whether you braved the chillier-than-normal temps at this year's Chicago Triathlon last weekend or you already know you're ready to put your triathlon races on hiatus until next season (maybe switching over to marathon training, fall road races, fall century rides or cyclocross), you can still get your triathlon fix in the off season. Check out these ways to squeeze in some off-season training...or start the ball rolling for a stellar season in 2010. Equinox Fitness' Equi-Tri Cycle--OK this may have been designed to prepare you for the Chicago Triathlon but just because the race is over doesn't mean you have to quit attending class. Taught in Chicago by Michael Wollpert, an Equinox instructor and personal trainer who has raced the Tour de France and spent part of August racing through South Dakota with the Primal Quest Eco-Challenge, you'll feel the leg burn whether you attend the lunchtime class in the Loop or the hour-long challenge the Lincoln Park or 900 N. Michigan locations. Plus, you'll have a chance to work on your cadence without having to dodge runners and walkers out on the Lakefront. 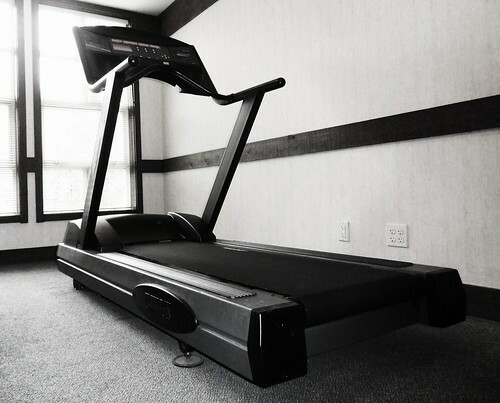 Equi-Tri Tread--The counterpart to Equi-Tri Cycle, the running component takes you to the treadmill usually immediately after getting off the bike to give you an indoor brick workout. Most of the hard-core triathletes bring heart-rate monitors to track their progress, but even if you don't have one you'll still benefit from this interval workout. Not to mention the instructor can watch you closely in this set-up to make the workout easier or more difficult depending on how you look. Masters swimming--Again, this is another one of those activities you probably wish you had practiced more before the race than after. But with the lake about to be technically closed to swimming until next Memorial Day, the fall swimming season is about to kick off indoors. Check your gym for its swimming schedule or consider swimming with Max Multisport or Vision Quest, to name a few, as the temperatures cool off. You'll find yourself able to stroke stronger through the crowds come next year. CrossFit--If you need a fitness boost but don't want to swim, bike or run, CrossFit could be the answer. Taking the best exercises from a variety of fitness disciplines, CrossFit pushes you to your max in a combination of moves that really work the core. The intensity is spot on too and you'll find your body morphing into toned form just by adding the workout of the day to your mix. Indoor cycling--Don't have a Spinning class you like or access to an Equinox Fitness? Find a place that offers indoor cycling on Computrainers and you're all set for winter workouts. You won't be trapped at home on your trainer, mindlessly pedaling away to whatever you can tolerate on TV and not tracking threshold, resistance or intensity. Around Chicago you can sign up for a Taste of VQ, a eight-week session that promises to improve your cycling, at Vision Quest Coaching; or check out the classes available at Element Multisport where you can sign up to ride up to four times per week in a six-week session; or consider one of the cycling options at Well Fit that can improve your endurance, strength and technique.